For automobiles, especially motorcycles, auxiliary lighting that augments the headlights can be quite useful, particularly when you need to drive/ride through foggy conditions and poorly lit or unlit roads and dirt tracks. Most primary lighting on vehicles still relies on tungsten filament lamps which have very poor efficiency. The availability of cheap, high-efficiency LED modules helps add additional lighting to the vehicle without adding a lot of burden on the electrical supply. If you want to add brightness control, you need to either buy a dimmer module, or roll your own. [PatH] from WhiskeyTangoHotel choose the latter route, and built a super simple LED controller for his KLR650 bike. He chose a commonly available 18 W light bar module containing six 3 W LEDs. 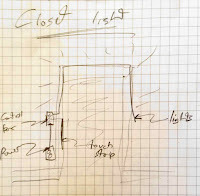 He then decided to build a microcontroller based dimmer to offer 33%, 50% and 100% intensities. And since more code wasn’t going to cost him anything extra, he added breathing and strobe modes. The hardware is as barebones as possible, consisting of an Arduino Nano, linear regulator, power MOSFET and control switch, with a few discretes thrown in. The handlebar mounted control switch is a generic motorcycle accessory that has two push buttons (horn, headlight) and a slide switch (turn indicators). One cycles through the various brightness modes on the pushbutton, while the slide switch activates the Strobe function. A status indicator LED is wired up to the Nano and installed on the handlebar control switch. It provides coded flashes to indicate the selected mode. It’s a pity that the “breathing” effect is covered under a patent, at least for the next couple of years, so be careful if you plan to use that mode while on the road. And the Strobe mode — please don’t use it — like, Ever. It’s possible to induce a seizure which won’t be nice for everyone involved. Unless you are in a dire emergency and need to attract someone’s attention for help. For example, it is easy to imagine a Pi in an automotive application where the Arduino would sense the ignition was off for a certain period of time and then go ahead and shut off the Pi. Or maybe the Pi needs to be turned on when a motion sensor fires and then turned off again once there is no motion for a particular time period. Any of these strategies would be simple to build with the Arduino. We’ve seen a similar project that used an IR remote as the trigger instead of a physical button. If you are afraid the Pi will just lose power unexpectedly, you might consider a battery backup. If powering a Pi with regular electricity is too tame for you, try steam. We’ve seen a growing number of posts and recommendations around the net regarding components, specifically transistors. “Don’t use old parts” they cry, “Go with newer components.” You can often find these recommendations on Arduino forums. This all came to a head with a page called “Do Not TIP,” which was linked in the Arduino subreddit. This page belongs to [Tom Jennings], creator of Fidonet, and one of the early authors of what would become Phoenix BIOS. [Tom] and a few others have been calling for everyone to send their old parts to the landfill – not use them, nor gift them to new experimenters. Get them out of the food chain. No offense to [Tom], but we have to disagree. These parts are still perfectly usable for experienced designers, and have a lot to offer new hardware hackers. TIP is the part number prefix for a series of power transistors created by Texas Instruments. In fact, “TIP” stands for Texas Instruments Power. The series was originally released in 1969. Yes, that’s right, 1969. Why are we still using parts designed when man first walked on the moon? The same reason people are still using the 555 timer: they’re simple, they’re easily available, they’re robust, and most of all, they get the job done. The TIP series has been used in thousands of classes, tutorials both online and off, and millions of projects over the years. Much of that documentation is already out there on the internet. The TIP series is also out in the distribution channel – they’ve been used for 40 years. Any retail shop that stocks a few electronics parts will have at least one of the TIP series. The TIP series aren’t always the best transistors for the job. However, for most hobbyist-designed circuits, we don’t need the best performance, nor the best price – we’re going to use the parts we have on hand. There is always room to improve once you get the basic circuit working. In [Tom’s] specific example, he’s using a TIP120 to control a motor at 5 volts drawing 1 amp of current. [Tom’s] big problem with the TIP120 is that it’s inefficient when running the motor. That’s because the TIP120 isn’t a transistor. It’s two transistors configured as a Darlington pair. Like everything else in life, Darlington pairs have trade offs. To achieve high gain, you end up with higher voltage drop. In high current designs, that translates into heat. In this case, 2 watts of heat, which [Tom] claims will result in melted parts and fire. It turns out that the datasheet shows 2 watts is the upper limit for thermal dissipation on the TIP120’s TO-220 case. It will get very hot, but it will not catch fire. Want to be on the safe side? Add a heatsink, which is as easy as attaching a piece of metal using the convenient screw hole in the TO-220 case. Just for fun, we created our own version of [Tom’s] example. We connected a TIP120 to a 12V lab supply. Rather than connect a motor, we grabbed our Re:Load Pro and set it for 1 amp. We use a 680 ohm base resistor to ensure the TIP120 was in saturation. The Re:Load Pro indicated that it was indeed seeing 1 amp of current flow, at 10.9 volts. This means that the TIP120 was only dropping 1.1V, rather than the 2V quoted on the datasheet. Were we just lucky? We tried a few TIP120s we had around the lab from a couple of manufacturers, and all of them were pretty close – well below the worst case 2V. Obviously you can’t design beyond the specs called on in the datasheet, but sometimes things work out in your favor. With the current set to 1 amp, the math is easy. The Re:Load Pro was converting 10.9 watts of power to heat. The TIP120 was dissipating 1.1 watts. The TIP120 did get hot – we measured up to 60°C. But it never went beyond that. A heatsink would have cooled things down, but we were shooting for worst case scenario. We ran this setup for 2 hours and there was no smoke, fire, or failure. Can you do better with a different part? Absolutely. [Tom] suggests a MOSFET such as the NTD4906N. FETs are great, we use them all the time. However, they come with a completely different set of rules and pitfalls compared to BJTs. Learning the rules, the design trade offs and pitfalls of both families of devices are key factors when learning electronics design. Every component a designer learns is a new color on their design palette. On the code side we worry about people becoming “cut and paste” coders. The same thing happens on the hardware side when a designer doesn’t learn how to use different types of parts. So don’t throw away your old parts. Use them, learn from them, and become a better designer for it! 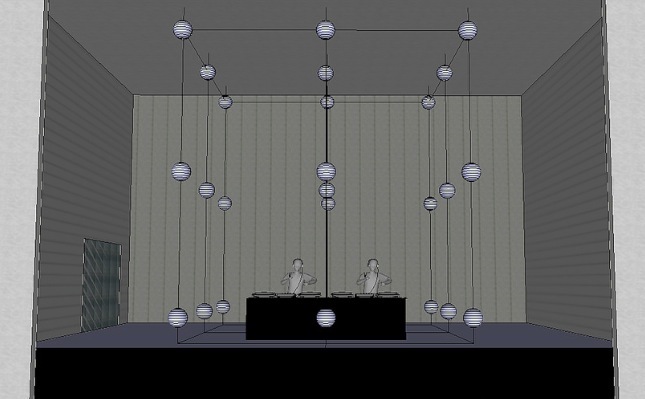 Cubled is an interactive installation made of 27 luminous spheres arranged in space to create a cube 5 mt (16.4ft) per side floating on a stage. The project created by Giuseppe Acito of Opificio Sonico has a structure made of steel wires, RGB LED Strips and Ikea paper lanterns. No DMX device was used for this system which is 12V DC powered, with slim electric wires in order to give the lightness needed to this installation. In this clip, the performance is splitted in 2 parts: in the first a kit of electronic percussion is “played” live by a step sequencer named Sonic Fraction Beatdown (a Max\MSP device for Ableton Live), the combinations of 12 MIDI notes generated are linked to the spheres. In the second part the combinations of sounds and lights are pre-programmed patterns clip and performed live by a Tenori-on Yamaha and Ableton Live. 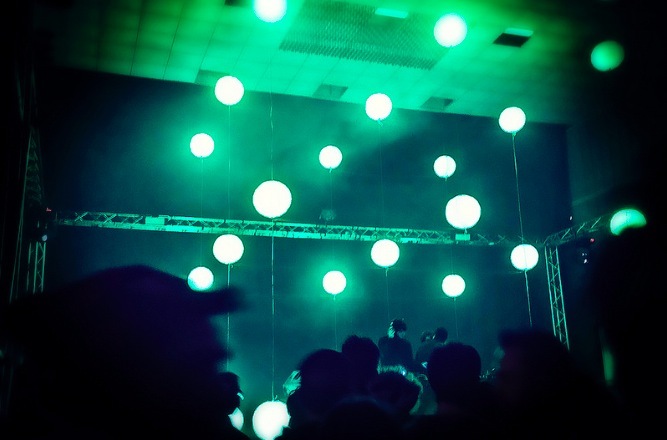 The installation was mounted inside the Link Club (Bologna – Italy) in December 2013, which hosted some world-famous DJ set, during a month of permanence. [Kirk Kaiser] isn’t afraid to admit his latest project a bit strange, being a plant-controlled set of robotic bongos. We don’t find it odd at all. This is the kind of thing we love to see. His project’s origins began a month ago after taking a class at NYC Resistor about creating music from robotic instruments. Inspired to make his own, [Kirk] repurposed a neighbor’s old wooden dish rack to serve as a mount for solenoids that, when triggered, strike a couple of plastic cowbells or bongo drums. A Raspberry Pi was originally used to interface the solenoids with a computer or MIDI keyboard, but after frying it, he went with a Teensy LC instead and never looked back. Taking advantage of the Teensy’s MIDI features, [Kirk] programmed a specific note to trigger each solenoid. When he realized that the Teensy also had capacitive touch sensors, he decided to get his plants in on the fun in a MaKey MaKey kind of way. Each plant is connected to the Teensy’s touchRead pins by stranded wire; the other end is stripped, covered with copper tape, and placed into the soil. When a plant’s capacitance surpasses a threshold, the respective MIDI note – and solenoid – is triggered. [Kirk] quickly discovered that hard-coding threshold values was not the best idea. Looking for large changes was a better method, as the capacitance was dramatically affected when the plant’s soil dried up. As [Kirk] stood back and admired his work, he realized there was one thing missing – lights! 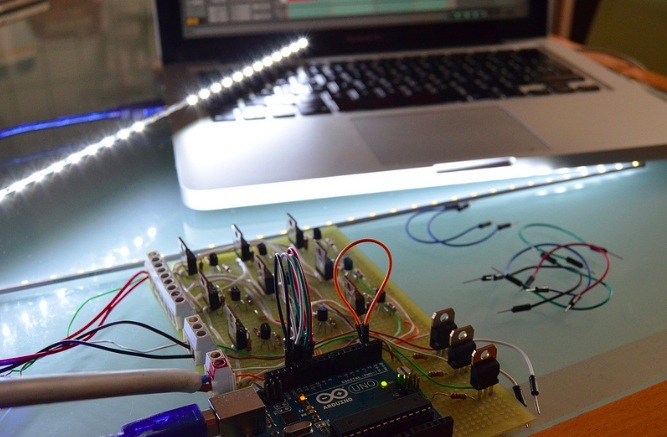 He hooked up an Arduino with a DMX shield and some LEDs that light up whenever a plant is touched. We do feel a disclaimer is at hand for anyone interested in using this botanical technique: thorny varieties are ill-advised, unless you want to play a prank and make a cactus the only way to turn the bongos off! We have two pantries in our flat, one of which could use some light. 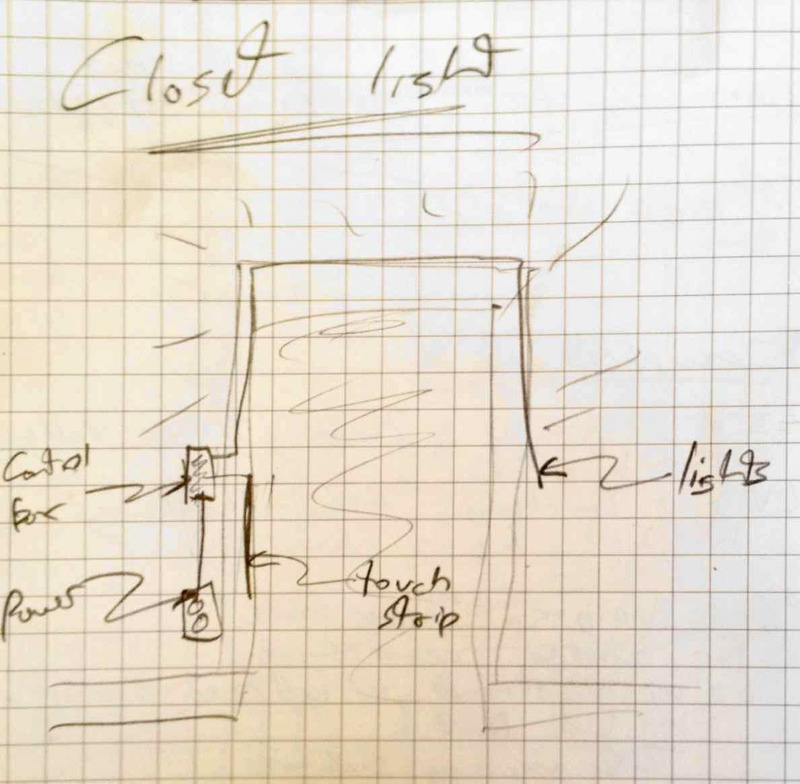 There's an outlet in there, but a simple solution won't do: I have more circuitry and time on my hands than I can handle, and the least I can do is make an over-complicated pantry light. AC-DC converter blocks with screw-terminals outputting 12V at 2A. I have a bunch of these-- came with the LED strips. A length of white LED strip. Lots of TIP-120-style MOSFETs, intended for a second light suit. It's fun to have a lot of high power switches around. Spare Arduino-compatible boards, including the "StripDuino" by "Tinkeract.com," here I quote the names since links go nowhere. The idea is simple-- rest your hand on the large strip on the door sill as you scan the pantry contents. The light will turn on if you tap the strip, or it will fade if you leave your hand on it. Indirect lighting from compact, dense LED strip tucked out of view. Touch surface works: aluminum foil with soldered wire plus a layer of hot glue and tape. PWM works with the MOSFET to control the LED strip nicely, with the board's 3.3V logic. For the light strip at full power, I measure 240.8 mA at 11.85 V, so 2.85 W of power. This is not much but it scales proportionally to the length of the strip. Capture the working circuit in an Eagle schematic. Build a looping sketch with the tap/hold fading behavior.